A San Antonio teacher issued an assignment, asking eighth-grade students to list the positives of slavery. 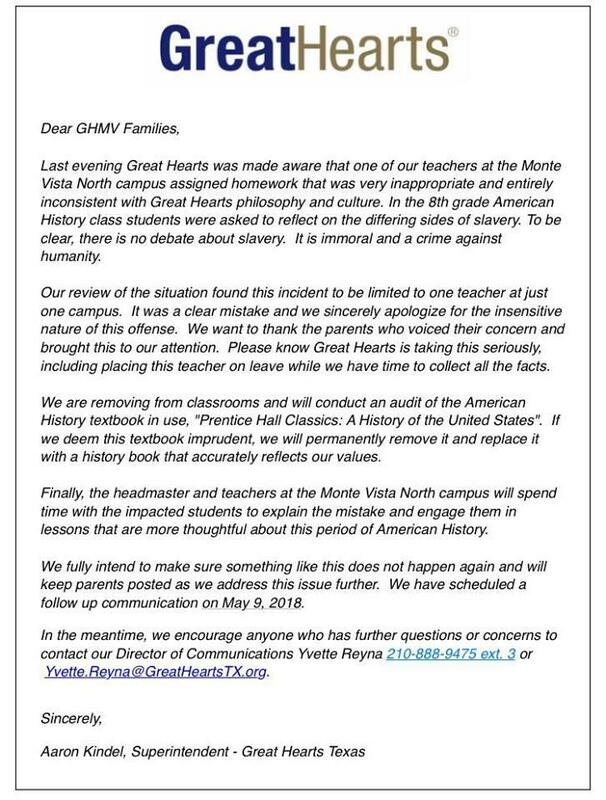 Eighth graders at Great Hearts Monte Vista North charter school Wednesday were assigned homework that suggested there is a positive side to slavery. The students were told to give a balanced view of the life of slaves by listing the pros and cons. Robert Livar’s son was one of the eighth-graders given the assignment. He left the positive side of the homework blank, and showed it to his parents. A letter of apology from Great Hearts Monte Vista North charter school. Kindel said Great Hearts Texas has been using the textbook for four years, but didn’t realize it used “insensitive language” until they examined it after Livar posted the homework assignment on Facebook. “Frankly, it was just not properly vetted at the time,” Kindel said. “We’re sincerely sorry that this incident happened. We absolutely agree that it’s unacceptable,” he added. Livar gives Great Hearts credit for responding quickly after he contacted the school.